We'll find out real fast if Minnesota really is among the best in the NFL. Based on the latest odds from Sportsline, the Eagles, Vikings and Rams are the favorites to reach the Super Bowl next season, followed by the Packers, Falcons, Saints and 49ers. What&apos;s frightening for the Vikings is that they have to play five of those teams in the first eight weeks of the season. It&apos;s a potentially deadly gauntlet, and part of the reason Colin Cowherd is betting that Minnesota "falls off the cliff" this season. It&apos;s even more daunting when you look further down the barrel and see back-to-back games against the Packers and Patriots in weeks 12 and 13. That&apos;s seven of Minnesota&apos;s 16 games against teams with top 14 preseason odds to win the Super Bowl. In terms of teams with the most games against teams with top 10 Super Bowls, no team has it worse than the Saints, although the Vikings aren&apos;t far behind. If not for the Minneapolis Miracle, Drew Brees and the Saints would&apos;ve played the Eagles in the NFC Championship Game last season. Now they face a schedule in 2018 that features six games against teams with top 10 Super Bowl odds. The Vikings have a front-loaded schedule that features three of the first five weeks on the road against the big dogs of the NFC. They have their bye in Week 11 followed by a tortuous back-to-back against Aaron Rodgers and Tom Brady. We rated Minnesota&apos;s schedule just ahead of Green Bay&apos;s simply because the Packers get to play one more of their tough matchups at home. Jimmy Garoppolo and the 49ers reeled off five straight wins to finish the 2017 season, including victories the last two weeks of the season against the Jaguars and Rams. The momentum has them riding high into 2018, but a very difficult stretch of games awaits them, especially early in the season. The defending champs only have two road games against teams with top 10 preseason Super Bowl odds. The Rams made a bunch of free-agent splashes to improve a team that won the NFC West last season, and their schedule is very reasonable in 2018. Now two years removed from the Super Bowl, the Falcons are rated among the best in the NFC going into the season they host the Super Bowl. 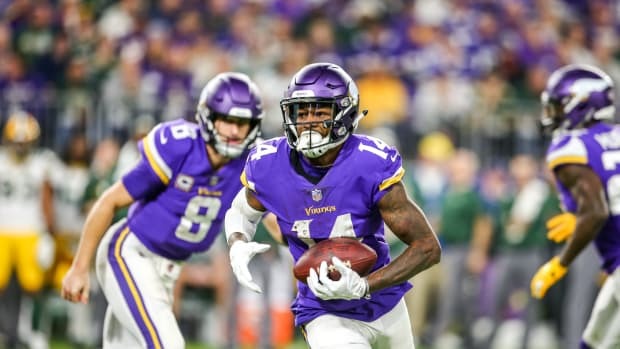 The NFC is loaded, and Minnesota will find out very fast if they&apos;re going to live up to the hype or, as Cowherd believes, fall off a cliff. NFC playoff teams are a combined 34-6 at home this season. They open against Case Keenum and the Broncos. First Pink, and now we find out that Brett Favre is on the Eagles' bandwagon. Everson Griffen said this is the best team he's played on since being drafted in 2010. The 69-year-old man penned a letter and sent it to the Rochester Post Bulletin. The celebrated quarterback thinks they have the most talented team. Incredible planning by the $84 million QB.